...Humans seem to be nothing but a walking injustice -- a featherless biped who makes mistakes. To be of passion is to yield to injustice. This is the life of the body and why some have argued for the need to be free of material existence if we are to achieve our moral ends. Surely, we should never claim to be a just person. This has never been our aim or conclusion. We have said only that we should set about to be just -- and also that such an ambition involves suffering and unhappiness. But is this distinction so important? It is what we fight for and must preserve. We know (without much effort or reflection) our disorder, the evidence of certain instincts, the graceless abandon into which we can throw ourselves. But we also know better now (because of our struggling efforts and reflections) the limits of our talk and action. We know better our possibilities. Often when we thought we were moving forward we were losing ground. Someday, when a balance is established between what we are and what we say and do, perhaps then, and we scarcely dare write it, we shall be able to construct the work of which we dream. "Shrill sound never roused me from my slumbers." Musical creation and expression are efforts that exhibit the silent threaded order of word and world and allow the meaningful possibility of a life that can be called good. Music can quiet and sober desperate lives. One must imagine Cage happy. 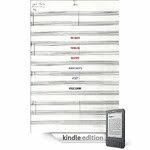 John Cage is ever presaging, but, to date, electronic publications of his writings are scant. 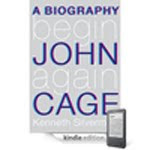 Kindle (my e-reader of choice) offers only three: Ken Silverman's Begin Again: An Autobiography of John Cage (Knopf, 2010), Kyle Gann's No Such Thing as Silence: John Cage's 4'33" (Yale University Press, 2010), and Richard Kostelanetz's Conversing With Cage (Limelight Editions, 1988). * Apple's iBooks (and wouldn't Cage's mesostics positively shine on an iPad) offers nothing at all. 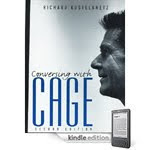 As the three Cage e-books go, it's not a bad line-up: a detailed biography, a comprehensive look at Cage's most infamous (and arguably most guiding) composition, and a compilation of conversational engagements (this last, happily, with an index). But, things are going to change. Wesleyan University Press, Cage's stalwart principal publisher for now 50 years, is hard at work with renderings of their entire Cage catalog into electronic form. But, here as elsewhere in the workaday world, Cage poses challenges: Cage's texts are anything but e-reader friendly, so publication (launch) dates are still uncertain. And while I'm at it, let me reveal (a bit ahead of the game) that Wesleyan University Press is busily preparing a 50th anniversary hardcover edition of Cage's maverick Silence (1961), with a beautiful foreword by none other than Kyle Gann. together chronologically under headings that suggest the direction each takes: "Criticism", "Literature", "Artists & Composers", "Politics", etc. There's a new "preamble" by Kostelanetz, and a new introduction, entitled "Master Kosti," contributed by John Rocco. 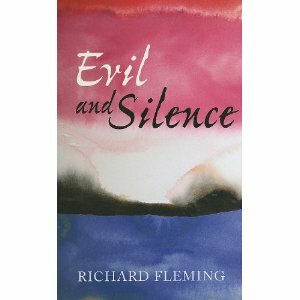 This work is nothing short of masterful recycling, and an elevation of the foreword to dizzying heights. Richard Kostelanetz is an accomplished writer, and prolific to boot; Cage's personal library houses some 14 of his tomes, while the John Cage Trust's print archive includes nearly two dozen. My personal favorites, in addition to the Cage-infused works, are Esthetics Contemporary (Prometheus Books, 1978), Text-Sound-Texts (William Morrow & Co., 1980), and The Theatre of Mixed Means (Dial Press, 1968), all long out of print. A few of his writings are also available for online reading at questia.com, a division of Gale, Cengage Learning.